With the encouragement of my mother, we traveled to La Paz to see where my late father, Nelson Beck grew up and the impact that my grandparents, Dr. Frank and Bessie Beck still have on the people of Bolivia. Days prior to leaving, we received phone calls from friends stating that this is not a good time to travel to Bolivia because of the country-wide blockades and protests between the government and the campesinos. We decided to proceed on, if Frank and Bessie can spend their entire lives there, through revolutions and wars, we can spend 10 days. My husband, Gary and I researched pictures and letters left by Frank and Bessie, and contacted relatives and friends for any information about the hospitals that Frank and Bessie established in La Paz and the altiplano. In 1912, Frank and Bessie were Methodist missionary teachers in Instituto Americano. Frank became director shortly before leaving for the States to study medicine at Northwestern University in Chicago. In 1927, when my father was 5 years old, they returned to Instituto Americano and leased a small building in the back of the campus grounds to start a new hospital, named Clinica Americana. Bessie states in a letter, "In the old locale next to the American Institute he began with three beds, a pressure cooker for a sterilizer, and a kit of instruments bought as World War I surplus. Our hospital property adjoined that of the school, with no gates in between on Landaeta Street." As their practice grew they began looking for a larger place to serve as the hospital. Bessie states, "We were not able to secure additional land so that we could have an outlet for the hospital, which would be independent of the school, as patients came day and night and it was not convenient for the school to have them going through their grounds. So we decided to move to Obrajes, 1000 feet below the city, in a beautiful suburb." They operated a medical clinic at Instituto Americano until l939, when the building of Hospital Metodista in Obrajes was completed. Bessie states, "Land was purchased from ex-president of Bolivia, Dr. Luis Tejada-Sorzana, and plans were made for the change to this new site. Mr. Irle, who was the general architect for the construction of new mission buildings, came from Chile to draw up the plans and start the work." When the hospital was completed it was the most modern in Bolivia, capable of handling 80 patients. Frank's particular pride was the home and school for 30 nurses. An important part of the medical work was the establishing of the Training School for nurses. Dr. Beck's daughter, Miriam, who had completed Nurses training and her B.S. degree in the States, returned to Bolivia in 1939 to start the regular three-year training course for nurses. By 1955 the nursing school of Clinica Americana had turned out 103 graduates. In 1960 hospitals, health centers and clinics throughout Latin America clamor for nurses trained there. At one time the public-health section of Servicio Cooperativo Interamericano, U.S. foreign-aid agency, had 34 Beck trained nurses on staff, declared them "the best in the world." Dr. Beck is gratified by such accolades, but even more by the fact that the Bolivian government is closely copying his nurse-training program in its public health service. He says: "The biggest contribution that medical missions can make is to stimulate others to do for themselves." From 1928, Frank with Nestor Perenanda who was a Methodist pastor, would translate Amaryan to Spanish for Doc when they would visit the Altiplano on my grandfather's motorcycle. Most of their visits were to the communities on the east shore of Lake Titicaca, in time they created a permanent location in Ancoraimes, called Hospital Frank S. Beck. Bessie writes in a letter from 1959, "There is a small consulting room and pharmacy here, together with a mobile medical unit, which Frank has recently put into operation, making regular visits to different villages along the Lake. He also is giving physical examinations to the thousand students in seventeen rural schools in this area. He takes X-rays, does minor operations, delivers babies, extracts teeth, and takes care of all kinds of medical cases. Recently a truck overturned along the shores of the Lake, throwing all of the passengers and their bundles into the water. Four were killed, and twenty-two injured, all of who were brought to our medical center for treatment. At first they were cared for in our kitchen and living room, where their wet clothing was removed and dried by the fire. In turn they were transferred to the consulting room to have stitches taken, bones set, and wounds treated. The most serious ones were put into our five patients' beds, while the others were taken by the Mission truck to their homes, where they were later visited for further treatment and observation. Since that time, the Mission Medical committee has approved the request for a gift of $12,000 to build and equip an operating room and additional rooms for patients, so that we can better take care of the medical needs in this area. In 1959, as a result of Frank's help, there were 18 Methodist schools on Titicaca's shores, plus a small clinic and a four-room cottage for the doctor. The schools and clinic serve 26,000 people, who come from 35 miles around. The settlement is named "Beck Memorial." The Beck's left Ancoraimes in mid-1964 when Frank was 76 years old. Dr. Frank and Bessie Beck's dream has continued with the help of the Andean Rural Health Care. In Bolivia, ARHC works through a local nonprofit counterpart, Consejo de Salud Rural Andino (CSRA). CSRA maintains an office in La Paz, which is directed by Nathan Robison. Nat is the son of missionaries from the United States and is a Bolivian citizen. I brought copies of pictures from Frank and Bessie's collection to share. When I showed a picture from 1957 of the doctor's residence in Ancoraimes to Nat Robison, after studying it he realized he was one of the children in the picture. I shared these photos with Eunice Zambrana, director of Hospital Metodista in Obrajes. When seeing these pictures, it brought back many memories from her days of working as a nurse in the Hospital with Frank and Bessie. When looking through the photo book, she walked me over to the gardener and introduced me as Frank and Bessie's granddaughter and Nelson's daughter. He looked into my eyes and nodded, "Yes, I can see that she is Dr. Beck's granddaughter." My blue eyes are from my grandfather. The Bishop and officers of the Methodist church expressed their pride and respect for Frank and Bessie for their contributions to the people. The younger officers who had not worked with them were knowledgeable of their dedication to their work, from the officers who had worked directly with Frank and Bessie. We were pleased to see that Frank and Bessie's message is still being carried on. When meeting with Senor Panteliz, Director of Instituto Americano, he informed me that Frank was a director of the school and showed me the classroom that Bessie taught in. I returned to the school later that day on my own to purchase T-shirts from the school's store, lost in the new surroundings I asked a custodian directions the store. While walking there I introduced myself as Dr. Frank and Bessie Beck's granddaughter. His eyes lit up and he repeated the words back, and stopped walking as if he needed more time to realize what I just said. He had very fond memories of them and was very honored to meet me. I raced back to the hotel room for the picture book to show him the old photos of Dad at school and Bessie and Frank in the hospital. A younger co-worker joined him and he explained to him each of the photos. Stated in an article published in Reader's Digest by Clarence W. Hall, titled "Bolivia's Most Unforgettable Character" it reads as follows: "I had not been in La Paz an hour before I understood why this remarkable American has been named "the outstanding. foreigner in Bolivia." "You know Dr. Beck?" I asked a traffic policeman. "Si, si, senor," he beamed. "Does not everyone?" In broken English he told how Beck had delivered his baby, worked until almost dawn to save his wife's life, then spent hours driving him about to spread the tidings among his numerous kin. "Ah, senor," said the cop, "there's a man who leaves his mark on you!" For more than four decades Frank Beck has been leaving his mark on Bolivians, first as teacher, then as doctor. Many of the country's leaders have either studied under him or received his medical administrations, often both. President Hernan Siles Zuazo, a former student of Beck in the American Institute, told me, "He awakened us to our responsibility to human beings as human beings. Can you understand what that means to the future of Bolivia?" Among missionaries he is a shining example of that vast company of the dedicated who cannot rest until they have left behind all of life's comforts and gone to earth's end to serve their fellow man." In the States, I contacted family and friends for information about Frank and Bessie. Each person would provide a piece information that would make the whole picture become clearer. The friends that cared for us in Bolivia were my father's school friends or students of Bessie. 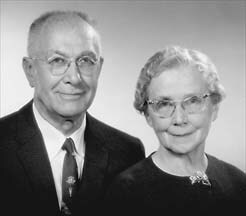 They were grateful to be able to give back something to the family of Frank and Bessie, since they gave so much to them. My father left La Paz in 1941 to attend college in the States. After marrying my mother and raising a family, he returned to La Paz for a short visit in 1983. My mother recalled memories from their visit that clarified stories about Nelson that she was not able to understand prior to the trip. After my Dad passed away in 1998 at the age of 72, she encouraged me to go and see the impact that he and his parents still have on the people of Bolivia and inform others so their dream is never lost. I can see that Frank and Bessie's dream of giving to others so they can help themselves, is still being carried on through the efforts of Instituto Americano, Consejo de Salud Rural Andino and the people of Bolivia.